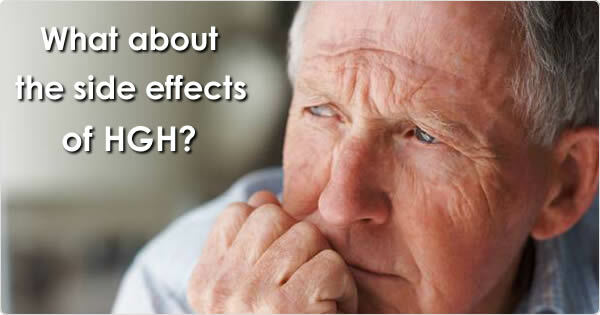 HGH Side Effects, is Human Growth Hormone Dangerous? Some warn of the dangers of human growth hormone. Such talk may frighten people into thinking that HGH is a dangerous steroid substance when it is a required hormone that helps to keep us healthy and vibrant. One important reason why young people are more healthy than those who are older is because they have an adequate supply of human growth hormone. When speaking of side effects I believe that some people may not understand that there is a difference in the human growth hormone made naturally by the body, which is called Somatotropin, and the synthetic HGH injections that are made by pharmaceutical companies, and whose generic name is Somatropin. Somatropin is a synthetic hormone replacement therapy (HRT) that causes most of the side effects we hear about. I consider this unfortunate because in aging adults restoring declining amounts of the body's own human growth hormone have been shown to delay and even reverse many of the effects of aging, as well as improve many health conditions. As previously stated, injecting ones self with synthetic human growth hormone can cause side effects and that is why the injections should be taken as the last choice and should only be used on the advice and management of a qualified physician. Aging adults who treat themselves, as well as young people who already have an optimum supply of growth hormone are at high risk for side effects when using the injections. One possible side effect of taking the HGH injections is the patient's pituitary gland becoming lazy. The injections provide the body with a full dose of human growth hormone so the pituitary gland will not need to release its own real HGH. For this reason it can be hard to get off the injections because if they are stopped abruptly the person may experience a "rebound effect" in which he loses the benefits he had gained and maybe more. This is the result of the body being left without enough growth hormone, since the pituitary gland will have become lazy. Acromegaly is a dangerous disease with increased incidence of heart attack and death. Acromegaly causes an unnatural overgrowth of bone in the extremities, forehead, and jaw, as well as other symptoms. In Dr. Rudman's study the anti-aging and health and fitness benefits were extensive but there were also side effects due to the large doses he used. Those who inject themselves with massive doses of HGH risk this same fate. There are also concerns that HGH injections may increase the risk of cancer, since hormone replacement therapy (HRT) with certain other synthetic hormones has been found to increase the risk of cancer in some studies. Taking homeopathic human growth hormone and supplements to help the pituitary gland release more of its own HGH has not been shown to increase the risk of cancer. In fact, it is believed that the real growth hormone made by the body actually provides a defense against cancer by increasing the cancer fighting cells and strengthening the immune system. Our high quality human growth hormone products provide a safe and effective way to enjoy the benefits of increased human growth hormone in the body without the risk of the side effects that may be seen with injections. Those interested in increasing their own human growth hormone release safely and effectively should learn more about our products, which come with a money back guarantee. You can always choose to take injections, but why take the risk if it is not necessary? By Lisa Wells, RN, working full time with HGH since 1999.